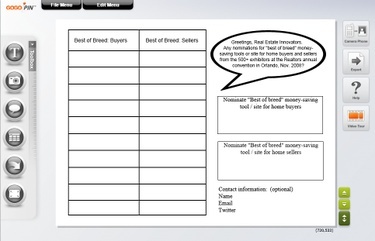 Used GoGoPin's new browser-based ad designer to create this call for nominations for "Best of Breed" money-saving applications for home buyers and sellers following the National Association of Realtors convention in Orlando, November 7-10, 2008. Watch this one minute screencast for more information on the proposed technology debriefing. Should we meet in person in Boston, like real estate round tables and technology debriefing hosted in the past by The Real Estate Cafe, or online so anyone can participate? If you attended the NAR convention and spent time visiting some or all of the 500+ vendors in the EXPO, we'd love to receive your nomination for "Best of Breed" money-saving tools for home buyers and sellers.